Louis Comfort Tiffany (1848 - 1933) is often associated with Tiffany & Co., the firm founded by his father, Charles Lewis Tiffany. Although Charles had hoped his son would succeed him as head of the company, Louis's interests leaned more readily toward those of an artistic nature. 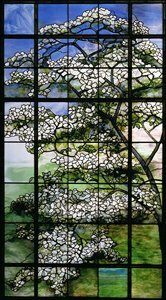 Louis Tiffany began his art glass experiments in the early 1880s at the time he was purchasing sheets of commercial window glass from outlets in Brooklyn. On December 1, 1885, he incorporated the "Tiffany Glass Company," which in 1892 was renamed The "Tiffany Glass and Decorating Company" and then, in 1900, "Tiffany Studios." At its height, the factory employed more than three hundred workers: designers, artists, glass blowers, and numerous other artisans. Tiffany's first commercially produced lamps date from around 1898, though some examples were exhibited at the 1893 World's Fair in Chicago. 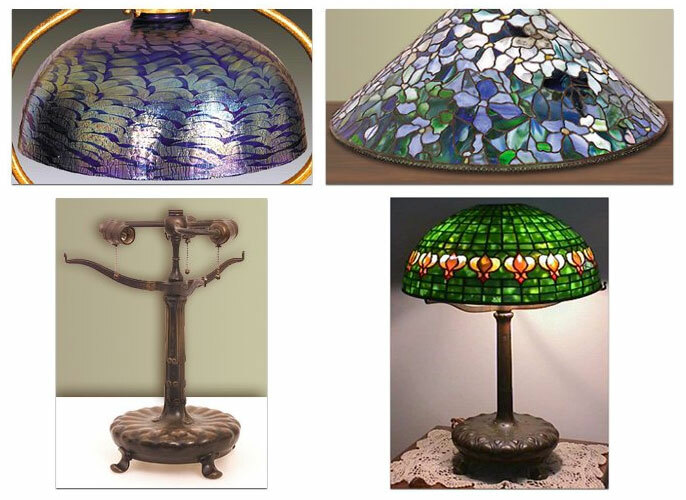 In addition to lamps and lamp shades, Tiffany Studios also produced vases, scent bottles, tiles, stained-glass windows, glass mosaics and desk furniture. The company remained in business until 1928. In 1919, Tiffany established the Louis Comfort Tiffany Foundation as a retreat for young artists at Laurelton Hall, his summer residence on Long Island. He died in 1933 at the age of 85. From 1933 - c. 1936 the firm's original "Ecclesiastical" department remained in business in order to complete the firm's outstanding window commissions. There are many old and new high quality reproductions and forgeries around of Tiffany Studios lamps. Many of them are so good they can fool dealers and collectors alike. Some of these have been made for more than 55 years, and they still continue to be made. Stamps, signatures and other markings are often added to imitations both during and after production to give them the appearance of being the "real" thing, and only expert appraisers and collectors with a trained eye for Tiffany's distinctive style are qualified to distinguish one from the other. See photo examples of a leaded shade rim stamped signature mark, a “monogram” base signature mark, as well as and the more typical “TIFFANY STUDIOS NEW YORK” base signature mark with model number in the photos to the right. Tiffany used bronze alloy bases on his desk, table and floor bases for the most part. With some exceptions, all of his bases will be signed on the bottom of the base plate, or if it has “legs,” on the bottom of a leg, “TIFFANY STUDIOS NEW YORK” with a number below that, in all upper case letters. This mark was used from about 1900-1928, although a few examples exist that are seen on his very latest lamps. The signature will be stamped into the metal. Unless the base plate was replaced, the signature should be present and readable. See the two photos on this page of typical base signature marks. Occasionally one will see another mark from one of Tiffany’s other companies. The other marks sometimes found are: The “monogram mark” which also had the initials “TGDCO” with it (those initials stand for “Tiffany Glass and Decorating Company,” 1892-1900), Tiffany Furnaces, Inc., (1902-1919), and Louis C. Tiffany Furnaces, Inc., (1920-28). The most commonly found signature is “TIFFANY STUDIOS, NEW YORK.” There are a small percentage these bases that are not signed. If there is a signature, however, it will have the name “TIFFANY” in all capital block letters on it. Tiffany also used all blown glass on a few of his bases, although it is not very common. The bottom of a genuine Tiffany glass lamp base might have the words “L.C.T. Favrile” etched into the glass. This mark can be easily forged, so these bases must be very carefully checked. Some bases also are not signed. So they all must be authenticated. Rarely, Tiffany Studios used art pottery for a base. These bases contain an “LCT” monogram and possibly a model number on their undersides, all inscribed by hand into the clay before the piece was “fired.” These pottery bases are not seen very often and are not terribly popular with most collectors. Not all pottery bases are signed completely, so again, they need to be authenticated by an expert. 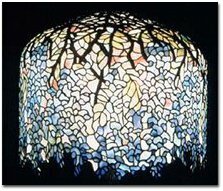 Tiffany used both leaded glass and blown glass shades. The markings for the leaded glass shades (assuming they are signed) is almost always on the bottom inner metal rim edge of the shade, stamped into the metal. 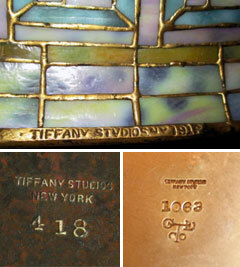 It should always have the words “TIFFANY STUDIOS NEW YORK” in all capital letters. Mixed upper and lowercase fonts are not authentic signatures. Sometimes there will also be a model number to the right of the name on the rim. It is usually going to be four numbers, with rare exceptions. Since not all lamps are signed (the majority of them are marked), the authentication of the shade glass and all else needs to be done by an expert. Below are examples of the type of detail we'd like to see in the photographs you send us of your lamp(s). To inquire about a lamp currently in your possession, please complete our Tiffany Lamp Assessment Form. Upon its completion, you will be furnished with the information you need to forward your digital images to us. Ideally, please take photos using outside natural light without a camera flash to show the most accurate and clearly detailed colors, signature marks and other details. If you have any questions on photos, feel free to call me or email. Each lamp created by Tiffany Studios was a unique, handcrafted work of art. The variety of designs and styles are many, and the images presented herein are only representative. Favrile Glass Lamps: Tiffany trademarked the name "Favrile" to generically describe his production. The term means handcrafted and is associated with the first and simplest shades made by Tiffany. Favrile glass included several types of glass which Tiffany also used in the making his beautiful stained-glass windows as well as leaded and blown shades. Today, the term Favrile is meant to describe forms such as shades and other types of "hollow ware" glass (such as a “floriform” vase). Geometric Glass Shades: Tiffany's geometric shades are the group of leaded glass shades with the simplest designs, and this would include standard shapes such as squares, triangles, rectangles and ovals, used on the cone, panel glass, and globe-shaped shades. Unlike his blown (also often called "damascene") shades, Tiffany's geometric shades were made from pieces of poured glass which were cut in segments and edged with copper foil, then soldered together. A patina bronze finish or "rinse" was applied to the lead or solder lines to blend in well. Tiffany's geometric group can be split into two types: shades made from a limited number of large glass pieces, such as the famous and much sought after "turtleback tiles," and shades made from a large number of small glass pieces. Floral Design Shades: The floral group is a combination or blend of both geometric and floral shades. It includes globe-shaped shades of basic geometric design with added floral, vine, and leaf motifs. The floral group is divided into two categories which are the shades with scattered floral or leaf patterns all over on geometric backgrounds, and the geometric shades with borders, called "belts" of flowers and vines. The latter shades are called "belted" floral shades. Cone Shaped Shades: Floral patterns are used extensively in the cone shades. Cone shades are basically just straight sided with circular rims. They were much easier and cheaper to make than leaded shades with curved or rounded sides. As a result, there are a significantly larger number of shades existing that were made in this shape. Cone shades are also found in the "geometric group," but they are named by their design rather than their form. 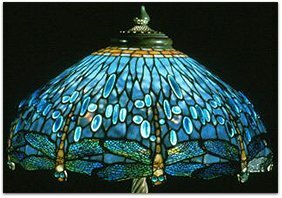 A very important design which Tiffany was fond of, which was often applied to the better cone-shaped shades, is the dragonfly. The dragonfly pattern was used more in the globe and "irregular" (see below) lower border shaped shades. It is highly desirable and often commands high prices in today's marketplace. Globe Shaped Shades: The plainer, flowered globe shades were much more difficult and detailed in their construction than the cone shaped shades. The dome design or shape helped the artists working on those shades to create a much more realistic scene or "picture" of the floral and insect designs that were used. Globe shades can range in size from twelve inches to twenty-eight inches in diameter. They were always the choice for large floor lamps. "Irregular Lower Border" Shades: These shades have a much more natural form, with their flowing, "serpentine" meandering rims. In this group of shades, you now can see a curved, irregular shaped lower border. Almost all of the shades used in the irregular border shade group are of the globe shape. Irregular Upper & Lower Borders Group: These were the most sophisticated and complex shaped shades done by Tiffany's craftsmen. The shades have both irregular upper and lower borders. In this group the typical straight edge of the top of the shade opening (aperture) is replaced by an openwork "crown" which is made to look like tree branches. The top "finials" have been also been eliminated, and light and heat are vented out through the top crown. 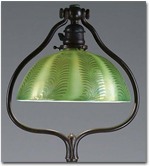 A good example of one of the finest of these shades is the Tiffany "Wisteria" pattern lamp shade. It is one of the most sought after and valuable of all the designs Tiffany ever produced, and as with most of his floral shades, it comes in various color combinations, from beautifully and intricately cut and positioned pale pastels, to rich, deep colored hues. While we invite your inquiries and photos regarding our services and information on the lamp you have in your possession, please note: We will give you our preliminary opinion as to authenticity (if what you have appears to be an authentic Tiffany lamp) and a broad price range. We do not however, provide free appraisals or other specifics unless we are going to help you broker your lamp..